Set Adobe Reader as Default PDF Program in Windows? I’ve grown to really like Adobe Reader for PDFs and would like to install it and have it as the default PDF reader on my home Windows computer. Can you help me out? Thanks! From its invention back in 1993 as part of Adobe Acrobat, the Portable Document Format (PDF) has proven to be a great success. Prior to PDF sharing formatted documents meant that both parties needed to have the same commercial program (typically Microsoft Word) and that it was difficult to create read-only versions to ensure that things wouldn’t be modified. Now, however, if you search for user guides, manuals, books, even comic books, you’ll find that there are millions of PDF documents available. Even governments now use PDF for forms and documents. Which leads to the observation that it’s pretty important to have a good PDF reader on your computer if you do anything other than just read Web pages. Heck, even Web pages can embed PDFs, actually, so even in that case, it’s important to have a good tool. 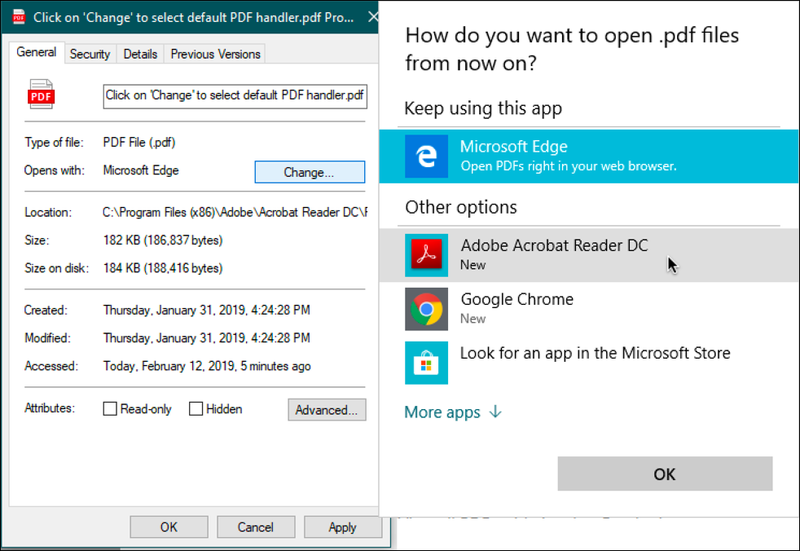 Modern Web browsers can show PDF docs – including Google Chrome and Microsoft Edge – but I still have a bias towards the free Adobe program PDF Reader (known more properly as Acrobat Reader, as we’ll see). Sounds like that’s what you are using at work too, so let’s get it installed on your home PC too. You can see that on this particular Windows 10 system I have no independent PDF programs, just two browsers that can handle the file format. Pay attention to that middle panel, which switches to default installing Google Chrome as part of the process. 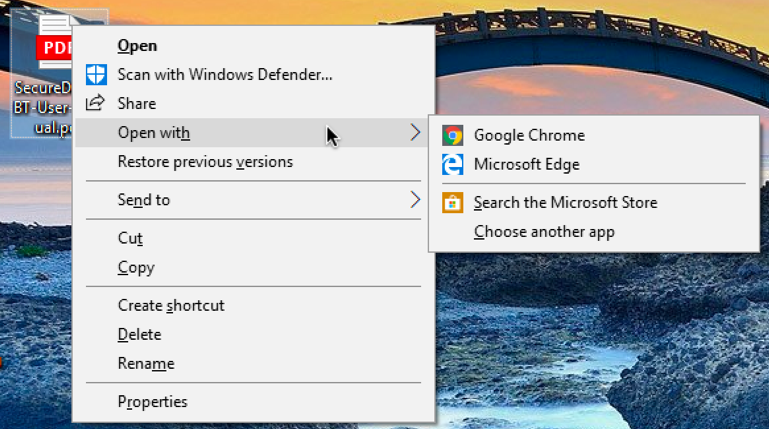 I’m a fan of Google Chrome, but I really dislike having additional software installed that isn’t required for the task; I suggest you uncheck that box and if you really want to install Google Chrome, just go to google.com/chrome to grab a copy. I am going to choose “Install anyway” since, as I said, it’s from a known and trusted site – adobe.com. 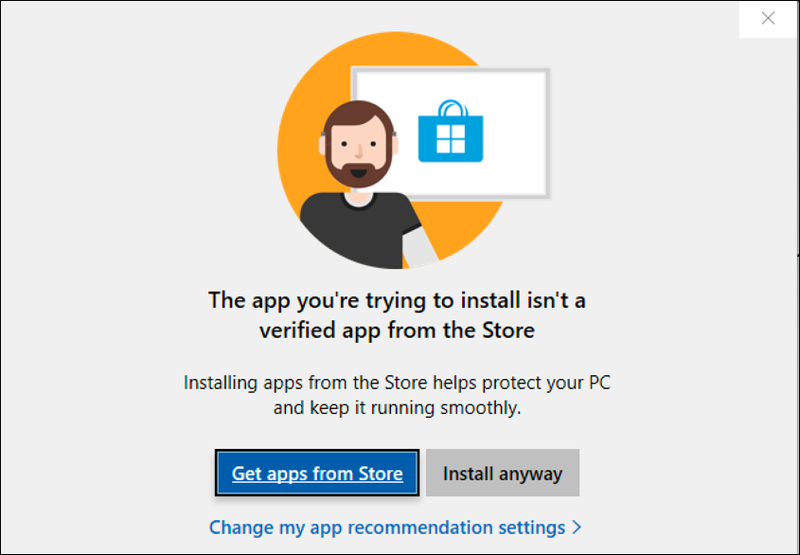 If you don’t see this warning, you might want to change your app recommendation settings to tighten up your PC security too. Easy enough. And it’s interesting in the above screen shot that you can see the old Windows style in the left window and the new, fancier and more colorful Windows UI on the right side. Old school, meet new school. Mission accomplished! Now enjoy all those glorious PDFs! Pro Tip: I’ve been writing about Windows for a long time and have quite a few Windows help pages here on the site. Please take a few minutes to check ’em out while you’re here. Adobe Reader was once my “go to” app for PDF’s but Adobe removed the function to Fill & Sign from the free version and the only way to get it is with a subscription. As a home user who fills out about maybe 10 PDF’s in a year, that price per page is about 5 bucks…forever! For a one-time purchase price, PDF SAM can be had for $50 that includes lifetime upgrades AND it is way more powerful and feature-laden than Adobe Reader ever thought about being. The way I look at that is after 1 year, my PDF editing is free. Adobe got greedy and got the hell away from Adobe.